My mother will turn 85 on New Year’s Day 2015. She has begun announcing that this is our last traditional Christmas celebration, complete with tree, wrapped presents, homemade festive meal, assorted guests and family members, cookie-baking marathon, cut boughs of holly, etc. It is time for a change, she says. I had always assumed that I would step in and take over the family Christmas traditions. For many years I have increased my contributions to the Christmas labor. But, this year, I had an unexpected number of music gigs in the weeks leading up to Christmas, and a wild week where I both attended concerts and played them. I went north to sing on the radio and to visit my best friend. I went to a local party. And amidst all that I stood by to receive shipment of my new “Clueless” CD. The CD was shipped December 10 from Oasis Disc Manufacturing via UPS with two-day shipping. The first notification I got said it would be delivered on Monday December 15 (NOT two-day shipping). Many emails and phone calls later I got a notification today on December 19 that it was on a delivery truck. Lo and behold it got here this evening and is available for purchase at long last. here this evening. In the meantime, Oasis offered to re-manufacture the CDs at no cost to me and to ship them this coming Monday. This means that I will eventually receive 600 CDs instead of 300, but it also means that I cannot get them to anyone but locals by Christmas or Chanukah: Now that the CDs have arrived I will carry a number of them around in my guitar case and backpack. I will also offer them for sale at Down Home Music and at CD Baby where you can get my 2009 release “Paris” and hear full-length versions of most songs, plus clips of the cover songs. 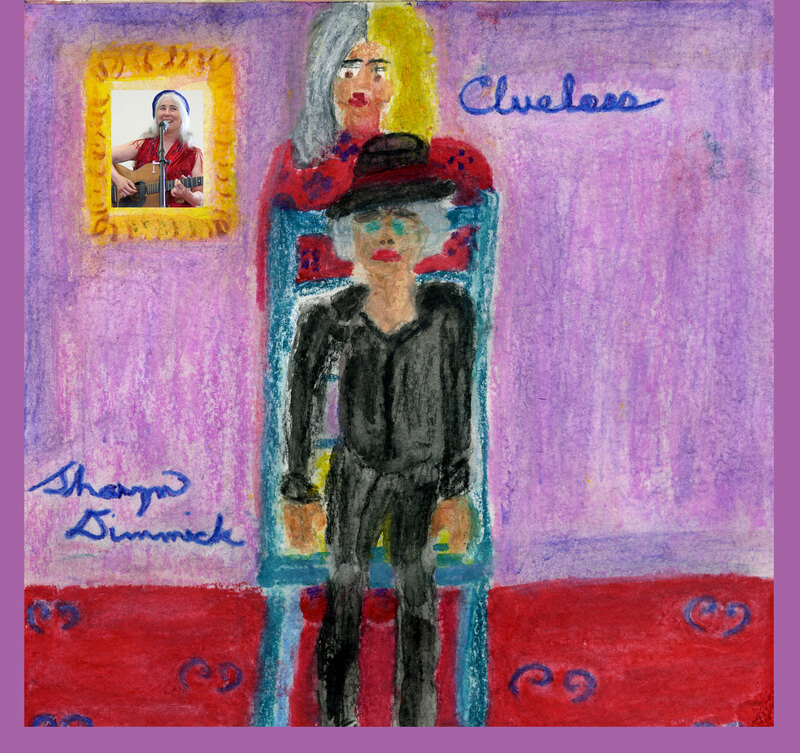 Soon I will begin the process of getting full versions of the songs from “Clueless” up on CD Baby as well. For now you can hear a couple of the songs for free on Reverbnation. What I have learned from this is that Oasis comes through for its customers, even in situations where they are not at fault and UPS — well, let’s just say that my brother who worked in shipping for a number of years recommends Fed Ex for deliveries. Anyway, as Christmas approaches, my participation has been limited to buying a few gifts (in October and November), and making ginger cookie dough (yesterday). When I feel better I will be making my famous cocoa shortbread and possibly a new cookie. Mom beat me to making pfefferneusse, Russian tea cakes, dream bars, apricot bars and sugar cookie dough, but I might make up a batch of Smitten Kitchen’s maple butter cookies anyway because my brother and I fell in love with them the first time I made them. I will put some Christmas music on as I lounge about today, awaiting the arrival of the “Clueless” CDs and hoping to put in a brief appearance at a music party this evening. Saturday morning I have one more gig at the Berkeley Farmers’ Market, if it does not get rained out. Saturday afternoon and Sunday morning I will be assisting my friend Elaine in preparing for her annual Chanukah party. I will spend Christmas Eve Day with Johnny, eating salad and tamales from Trader Joes, after serenading the morning commuters with Christmas carols. I return home in the evening to rest before assisting Mom with the last Dimmick Christmas feast marathon the next morning. All traditions come to an end, changing in subtle ways before they become part of the ghostly past of memory. No one can remember what year I started buying Straus whipping cream or what year we stopped making homemade caramels or what year I put candied ginger in the pfefferneusse or what year I invented the shortbread. It has been a long time since I sent you an update, much less a painting or a recipe. As Christmas Eve turned to Christmas Day I was standing in the kitchen at my mother’s house, baking a last batch of Russian teacakes, a traditional holiday cookie for us, consisting of butter, finely chopped walnuts, powdered sugar and enough flour to hold it all together. I had bought fresh walnuts in the shell from the Berkeley Farmers’ Market on Saturday morning and shelled them earlier on Monday evening while listening to Christmas carols on public television. Unfortunately, I had not consulted the recipe for amounts and had shelled just 1/2 cup when I needed 3/4 cup: as soon as I looked at the cookbook I went back to shelling nuts and wielding my chef’s knife. It was an all-cookie Christmas this year, supplemented only with batches of Betsy’s delicious Italian Glazed Almonds. I did not have funds available for purchasing gifts in 2012, so I made them, Cocoa Shortbread and Pfefferneusse, Smitten Kitchen’s maple butter cookies, thin Moravian ginger cookies. For several days I busked in the Berkeley BART station in the morning and baked in the afternoon and evening, preparing a silver tray of cookies for my friend Elaine’s Chanukah party, packing a waxed cardboard box with almonds for another. When I wasn’t baking I was borrowing a guitar from Fat Dog at Subway Guitars who kindly lent me a Johnson to play while my beloved Harmony went to the guitar doctor, who treated her for a couple of serious cracks, rehearsing with Johnny for a gig at Arlington Cafe in my home town or giving my annual Christmas music party for which I prepared butternut squash soup, Mexican corn soup, Swedish rye bread and Finnish cardamom bread. 1) My mother and brother are healthy and here to celebrate Christmas with this year. 2) I have a pleasant and safe home to live in. 3) I have found someone to love who loves me back. 4) I, too, am healthy. 6) Johnny and I played a gig together in my hometown to generally favorable responses and both ended the evening in the black financially. 7) Friends came to hear us play. 8) My song about our courtship, “Clueless,” continues to be a runaway hit and fun to play. Honestly, I can’t remember more of those midnight thoughts now. Suffice it to say that I thought of my patient readers who have put up with my long absence from the blogosphere. Just in case anyone has not had enough cookies over the past month or has never made Russian teacakes at home, I’ll share the recipe with you, slightly modified from that presented in our Betty Crocker Picture Cookbook. Soften 1 cup (two sticks) of butter — I use one stick salted butter and one stick unsalted. Combine butter with 1/2 cup sifted confectioner’s sugar and 1 tsp vanilla extract in electric mixer until creamy. Slowly add 2 and 1/4 cups sifted flour, about 1/2 cup at a time, incorporating flour completely before each addition. Chill dough as necessary. If you work late at night in a cold kitchen you will not need this step (or want to wait for the dough to chill either). Before baking, preheat oven to 400. Bake cookies for 10 to 12 minutes until some color shows on the bottom edges. Roll warm cookies carefully in powdered sugar — they are delicate and will develop mangy-looking spots where the butter comes through. Let cool and roll again, or sift or sprinkle more powdered sugar to cover each cookie. Store in airtight tins for up to a week or two. (Mom recommends providing other cookies for the family to eat if you want to keep Russian teacakes on hand very long). Food notes: the fresher the walnuts, the better the cookie. ‘Nough said. If you live in the South you could try making them with local pecans. If you prefer to bake exclusively with unsalted butter you will want to add 1/4 tsp of salt to your sifted flour. I use unbleached flour in these. Mom likes all-purpose. I have never tried them with a whole-grain flour — part of their attraction is that they are snowy white and ethereal. We only eat them once a year…. Painting notes: The reign of the emperor’s new clothes is long. You’ll know I am painting again the day you see a new painting here. Also, it has been so long since I’ve taken a photo that I cannot find the charger for my camera battery. Oops. Writing classes: I will be teaching a six-week writing practice group on Tuesday nights in the East Bay starting January 8, 2012. My teacher Natalie Goldberg developed writing practice as a way to help people get their real thoughts on paper. For more information, see my ad on craigslist. Lemon Bars. 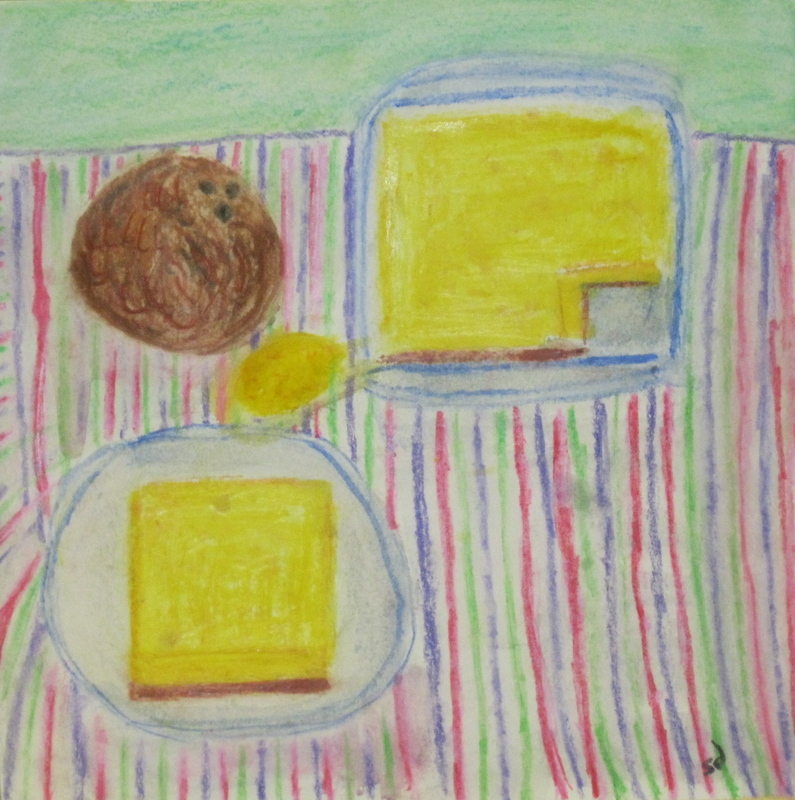 8″ x 8″ watercolor pencil. Sharyn Dimmick. Two of my mother’s favorite flavors are brown sugar and coconut: when she was a child she mixed up a big jar of coconut and brown sugar, planning to eat it. Not only did her mother punish her for “wasting food,” she also threw out the mixture. Now, I ask you, who wasted that particular food? Anyway, I arrived home yesterday from several days in the foothills of Amador County. In my absence, Mom had made a pot pie and roasted a pork loin and some vegetables. As we ate the pot pie for lunch, Mom said, a little sadly, that there were no sweets except chocolate and that she might have to just eat oranges. Down to the kitchen I went, taking the Medrich cookbook with me: I would use her recipe as a guideline for my lemon filling because she likes a tart lemon bar. I dug out the recipe for lemon pudding from a file box in the cabinet and studied the crust ratios for three recipes. I decided I would use 1/3 cup butter, 1/3 cup whole wheat pastry flour, 1/3 cup crushed Wheaties and 1/3 cup flaked coconut, plus 1/4 cup brown sugar for the pastry base, which I combined with a pastry blender and baked for twenty minutes in a 350 degree oven. I then turned the oven down to 300. I meant to use Medrich’s measurements for the lemon filling, but I couldn’t bear the thought of 1 cup plus 2 tablespoons of white sugar, so I decided to use 1 scant cup instead. I was aiming for her 1/2 cup of lemon juice, but after I zested and squeezed five small Meyer lemons and one stray tangerine that some cat had batted under the sideboard (it resurfaced last week and had seen better days, looking a little battered), I had 1/3 cup juice plus a little and decided to go with that. I used 1 Tbsp of whole wheat pastry flour and 2 Tbsp of all-purpose flour, whisked that with the 1 cup sugar, whisked in three eggs, added the lemon juice and zest, and poured the result onto the hot crust. I baked the bars at 300 for nearly half an hour until the filling no longer jiggled when I tapped the pan. I cooled the pan on a rack while I went to Berkeley to pick up my vegetables. It was a bad day for bus service: I returned three hours later, put the vegetables away and cut the first square from the pan. I cut it in half and brought half to Mom who was watching T.V. She approved of the strong lemon flavor, but wondered why there was no topping. I said that lemon bars usually don’t have a topping and if I had made crumb topping for the top it would have taken twice as much butter. She asked why I hadn’t dusted them with powdered sugar and I said I was afraid that they would be too sweet. These lemon bars came out buttery and lemony with a delicious brown sugar and coconut crust. Despite the scant cup of sugar they were not too sweet. Many lemon bar recipes call for shortbread crusts that take an entire stick of butter: with 1/3 cup of butter, the flavor of butter comes through beautifully. Food notes: To get a generous 1/3 cup of juice I used five small Meyer lemons and one small battered tangerine. If you use Eureka lemons, you may not need more than two. Meyer lemons are sweeter and less acidic than ordinary lemons, so you may need to increase the sugar to a generous cup and add a dusting of powdered sugar. If you have access to Meyer lemons, you can follow my measurements exactly, if that is your style. I was afraid to use all whole wheat pastry flour in the filling, but it worked fine in the crust. If you do not have Wheaties, you can substitute ground oatmeal (put rolled oats or quick oats in a blender for a few seconds), crushed wheatmeal biscuits, or a dry cereal of your choice. A few years back, Mom had a hankering to make pfefferneusse, a cookie she remembered buying in her childhood in Illinois. Pfefferneusse are small round spicy cookies frosted with royal icing flavored with anise. They are not everyone’s cup of tea, but if you like gingerbread or chai and you eat Good ‘N’ Plenty or black licorice, these are for you. Mom had a basic recipe for pfefferneusse, typed on an index card. The only problem I saw with it is that it called for candied peel — can you say “yuck?” I pictured the multi-colored tubs of peels and fruit that Mom kept around for fruitcakes. And then I had an inspiration: what if we substituted candied ginger for the nasty candied fruit? It wasn’t hard to talk Mom into the recipe alteration. The first year we made them, these cookies were okay, but Mom said there was something missing. Thinking about the name, she combed around through other cookbooks and found that pfefferneusse used to contain pepper, in addition to mace, cinnamon and allspice. The second time we made them we ground some fresh white pepper in the coffee grinder and added that to the cookie dough. Now you are talking. This year I added back just a touch of my home-candied non-yucky orange peel, picking the last orange peels from the jar of mixed lemon, orange and tangerine peels that I made last March. I present to you our version of pfefferneusse, a non-rich, spicy cookie that is a good foil for butter cookies and shortbread on the holiday cookie buffet. Pfefferneusse are cookies that get better as they sit around: the flavors mellow and blend and the icing keeps them from getting too hard. Make them ahead of when you want to eat them: the dough benefits from chilling for at least a day before you bake the cookies. I made my first batch of the season on Wednesday morning, baked them on Thursday afternoon, frosted them Thursday night and served them to guests on Friday. Gradually incorporate 2 cups of white sugar. Add 4 cups of flour — it will make a stiff dough. Fold in 1/2 cup minced candied ginger. Cover the mixing bowl with something (a tea towel, waxed paper, or plastic wrap) and set in the refrigerator to chill for a couple of hours. After a couple of hours, remove the dough from the refrigerator and knead it for awhile, in the bowl or on a board. If you use a board, try not to incorporate further flour. Return the dough to the refrigerator overnight. Lightly grease a couple of baking sheets. Form dough into balls the size of a small walnut and place them on prepared cookie sheets. Bake each tray for twenty to twenty-five minutes. Cookies should firm up but not brown much if at all. If you have a favorite recipe for royal icing, go ahead and use that except substitute anise flavoring for any vanilla, lemon extract or almond flavoring you usually use — if these don’t have anisette frosting they are not really pfefferneusse. I separate 2 eggs, put the yolks in a jar covered with water in the refrigerator for another use, and beat the whites. When the whites are opaque, but not yet stiff, I start adding powdered sugar while continuing to beat them. When the icing is somewhat thick and glossy I stop and stir in some anise flavoring: you have to taste it to do this step — too much and it will remind you of toothpaste, not enough and what’s the point? If you are timid, you can add it drop by drop and stand there tasting it forever. I would recommend with beginning with 1/2 tsp and increasing the extract according to your tastes. Frosting things is not my forte: I usually do it the quickest way, which is to pick up each cookie, dip it in the icing, twirl it to get rid of any drips and set it on brown paper. One further note: you need a dry day to frost them or your icing may turn tacky, even if it hardens initially. Let them dry fully before storing them in an air-tight container. 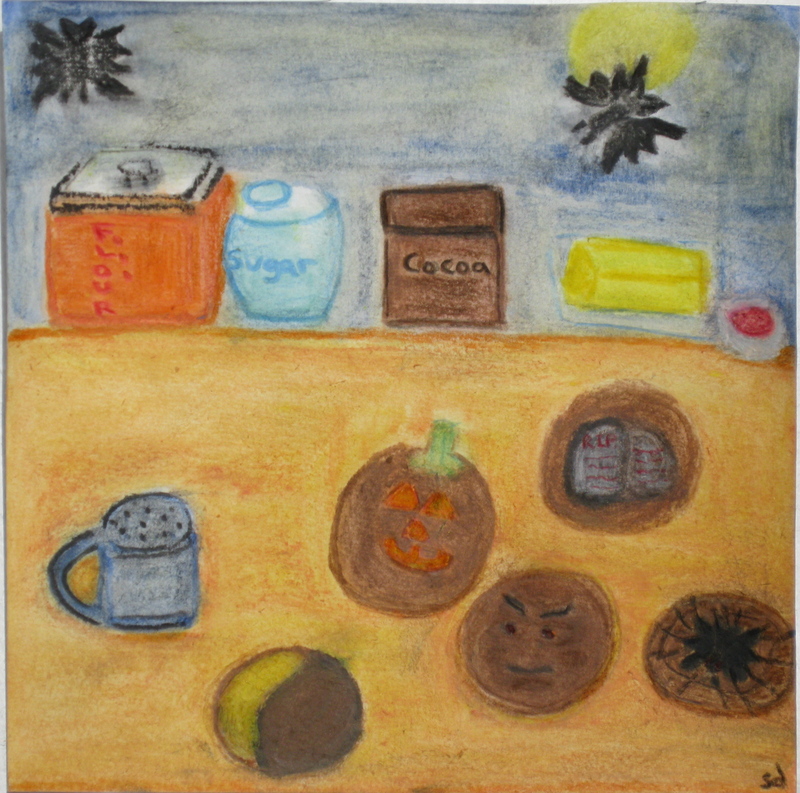 Trick or Treat — What Happened to the Cocoa Shortbread? Trick or Treat. I’m not here, am I? Because I’ve gone to post on ArtEpicurean for pre-Halloween fun. Please follow me over there for a delicious treat, my beloved cocoa shortbread cookies tricked out in Halloween costumes. 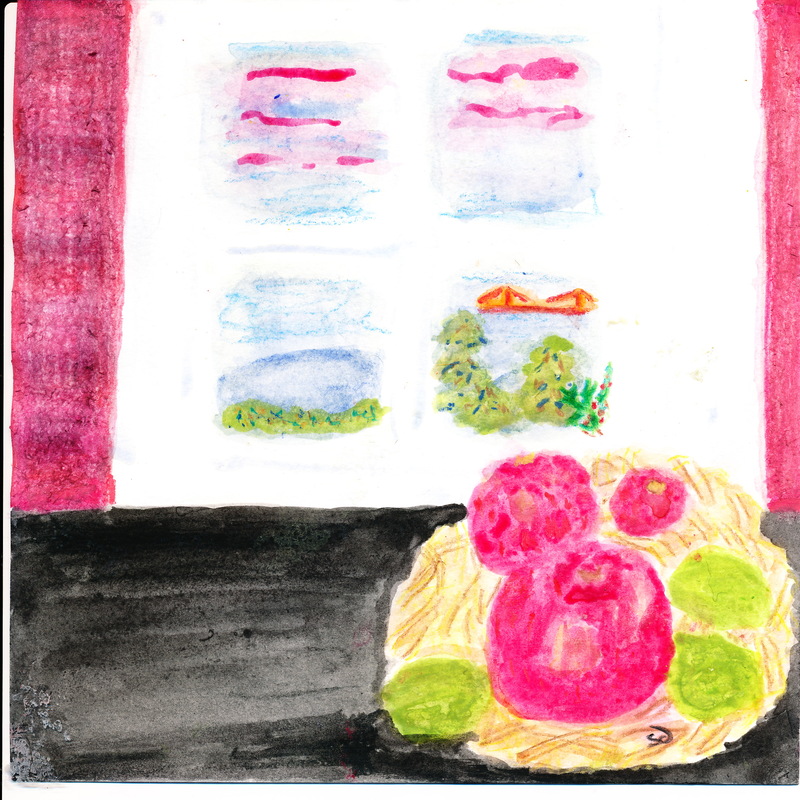 Usually, I don’t break out this recipe until Christmas, but I wanted to do something special for Jane, a woman after my own heart who posts recipes inspired by or accompanied by paintings. 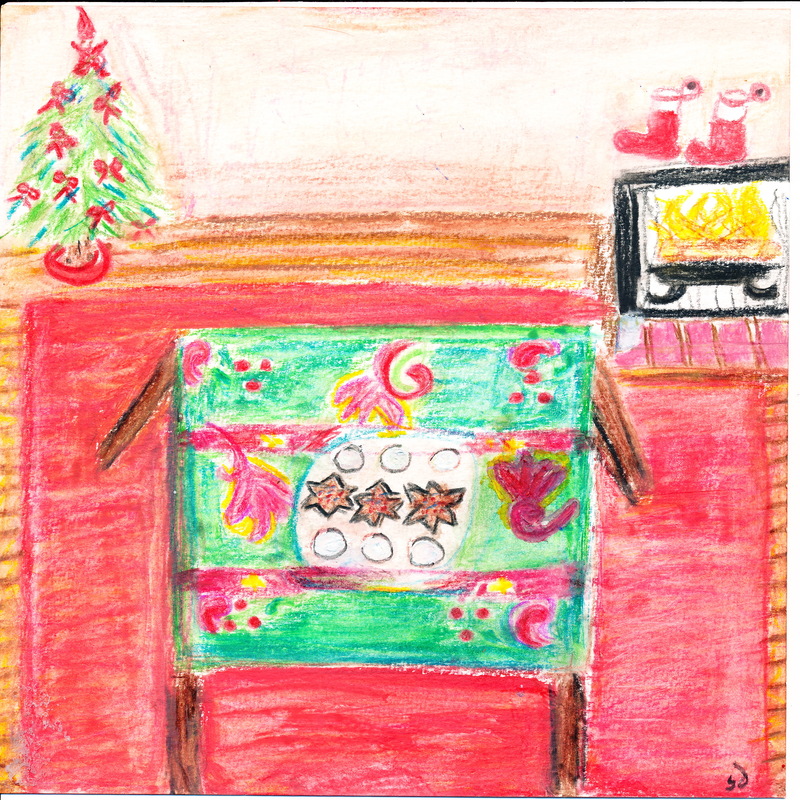 I’ll give you a thumbnail of the cookie painting, but please go visit Jane’s blog for the recipe. You won’t be sorry. Just click on the link that says ArtEpicurean in the first paragraph if you haven’t done so already, or scroll all the way down to the bottom of the page and click ArtEpicurean in my links section. We’ll save you some cookies. P.P.S. The link in the first paragraph works now, thanks to Sally B. Sorry that it failed earlier. Update: It is now approaching Christmas 2014 and the ArtEpicurean link no longer works so I have decided to re-post my cocoa shortbread recipe here as a service to all lovers of shortbread and chocolate. As always, using the best-quality ingredients you can find or afford will yield the most delicious shortbread. Chill dough for at least an hour. This step is important for both flavor and texture. Bake for twenty minutes at 300. For best results, rotate baking trays from back to front and from bottom to top rack at the ten-minute mark. Use caution in removing cookies from baking sheets — they are tender when hot and can break easily if you touch an adjoining cookie while working your spatula under another. Note on ingredients: You can use unsalted butter if you prefer. If you do, add just a pinch of kosher salt to the dough to avoid a flat taste. I like to use one stick of unsalted butter and one stick of salted butter and omit the salt. Use vanilla extract, rather than artificial vanilla — it costs more, but you don’t have to use a lot, the flavor is superior and it does not have dodgy chemicals in it. You can also make your own vanilla if you have vanilla beans and spirits lying around. You could also try infusing the butter with ground vanilla beans instead of using extract (I haven’t tried this option yet). Coarse colored sugar works better than fine sugar, which can end up being absorbed into the dough as it baks. Nevertheless, I have had some success with making my own colored sugar out of either turbinado or white sugar by shaking it in a jar with food coloring. Shake well and save money. 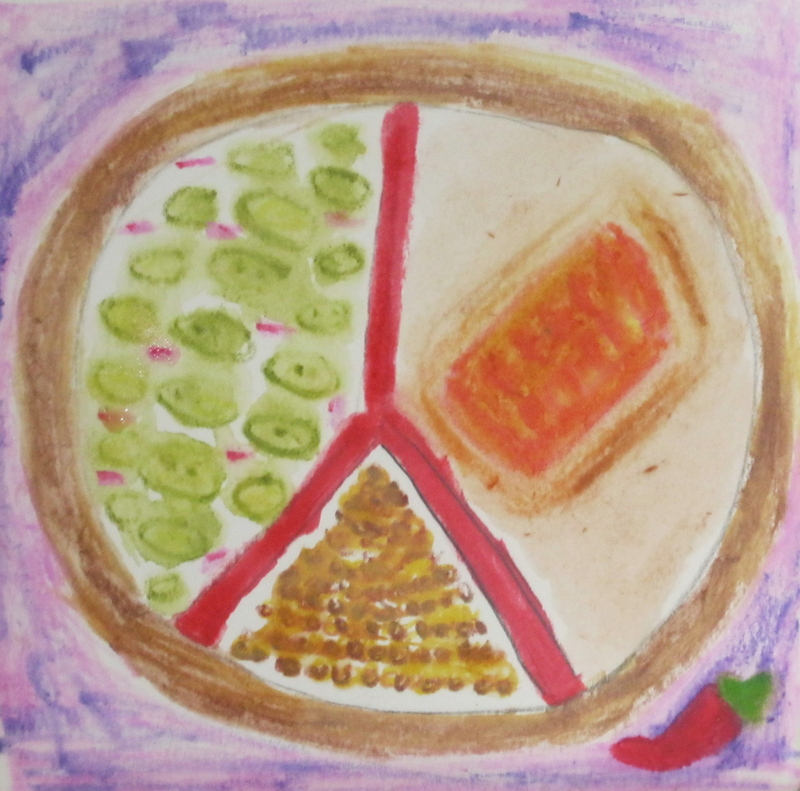 Turquoise, purple, hot pink and light lime green look beautiful on the dark dough, as would a light orange yellow. Mocha enthusiasts could add a pinch of instant espresso powder to the dough.